It Is the start of a New Year. Many people make New Year resolutions, want to start clean, have healthy eating habits, get back into shape, cleanse out your system, to work towards a better YOU! It is extremely important to fuel your body with the right foods, to eat a whole lot of vegetables, protein and carbohydrates, to provide the right nutrition that your body requires. As they say “Eat the Rainbow”! Eat your way through natural colors in your diet for a healthier YOU! I love eating salads for meals with a protein component, and being vegetarian, my options are limited to having lentil/legume patties, or tofu, or paneer, along with some nuts. 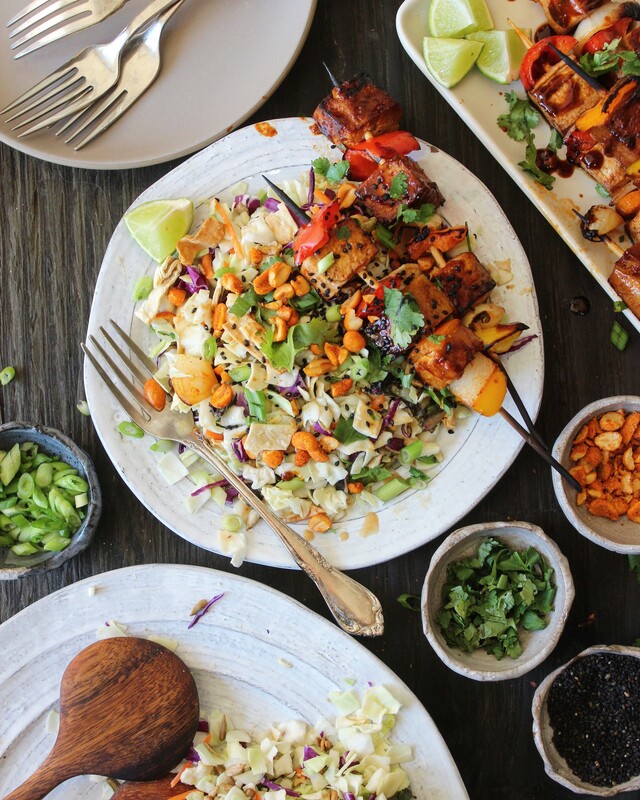 I am really excited to partner with FeedFeed and Earthbound Farm to bring to you a really delicious, organic, nourishing, healthy, colorful recipe! Earthbound Farm has been around since 1984, and are located in the beautiful Carmel Valley and have grown their business to 50,000 acres of gorgeous organic produce! Their motto is to not conquer the beautiful planet with chemicals and have made a commitment to farm organically, and believe that they grow happy people with healthy bodies, nourished by their organic produce. They grow their produce with zero toxic synthetic chemicals and are non-GMO based. I have been using their products for a while now, and you can taste the freshness in their produce! Earthbound Farm has come out with their line of Organic Chopped Salad Kits. If you are short of time, and need a quick fix for dinner, prepare your protein a day ahead or over the weekend, and assemble it with this ready-to-go chopped salad kit with the dressing and other accompaniments within minutes! They have 3 different varieties of Chopped Salads : Asian, BBQ Ranch, Southwest. 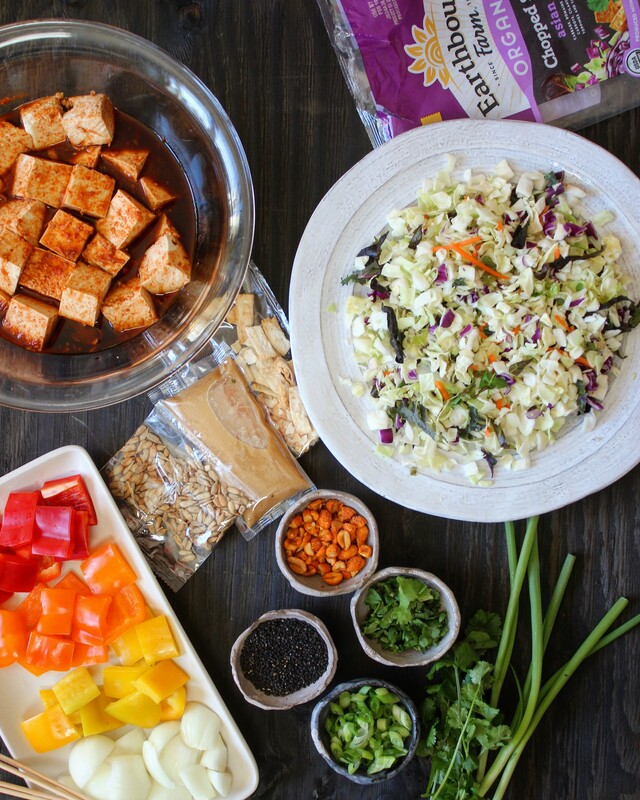 My recipe uses the Organic Asian Chopped Salad Kit, which features cabbage, romaine, kale, carrots, cilantro, accompanied by crunch toppings and a tahini dressing. The tofu, along with some chopped peppers, and onions, is marinated overnight in a blend of sesame oil, gochujang paste(Korean red pepper paste), tamari, rice vinegar(mirin), honey, grated ginger and grated garlic. The tofu and vegetables are put on a skewer and grilled on a hot grill pan until the tofu and vegetables are charred on all sides, and has a lovely smokey flavor to it. 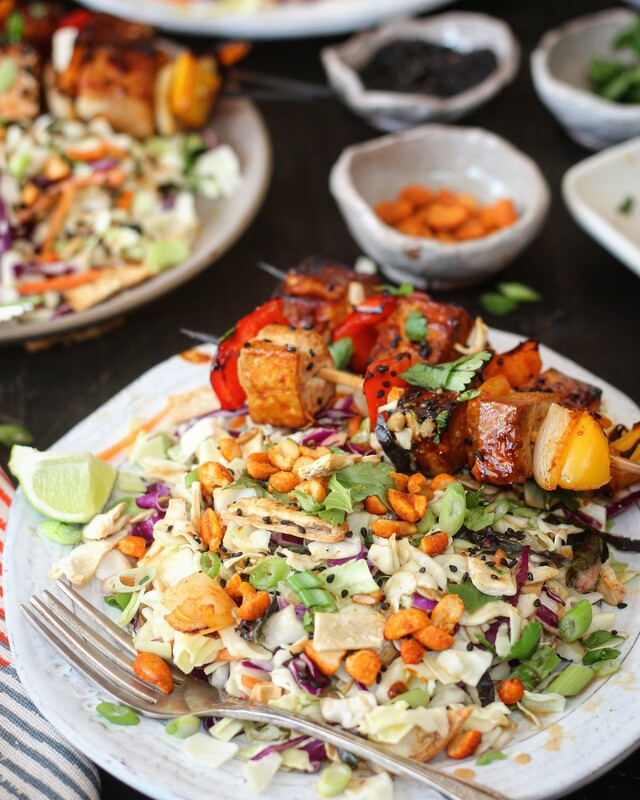 Once your protein is ready, plate it on a bed of the salad, from the salad kit, drizzle with some of the tangy tahini dressing, with a final sprinkle of black sesame seeds, scallions, peanuts and cilantro! Do not forget the squeeze of lime for a touch of tanginess! Your meal is ready within minutes! In a medium bowl, mix the tamari, mirin, gochujang paste, ginger, garlic, sesame oil. Whisk it, till it is a smooth consistency. Gently add in the cut tofu, and make sure all pieces are coated with the mixture. Cover with saran wrap, and let it marinate in the fridge overnight. Soak the bamboo skewers in warm water for about 15 minutes to prevent sticks from burning. Now alternately, add red bell pepper, onion, tofu, orange bell pepper, onion, tofu, yellow bell pepper tofu, any pepper or onion to a skewer. Continue until all skewers are completed. Get a grill pan ready on high heat. Brush with vegetable oil. Add 3 skewers at a time diagonally on the hot pan. Let it cook for about 2 minutes, then turn the skewer to cook on the other side, until all sides are grilled evenly. Alternatively, you could put ALL the skewers on a sheet pan, covered with aluminum foil, coated with olive oil spray. Set the oven to broil on HIGH. Put the sheet pan in the middle rack and let it broil for about 3-4 minutes on each side, until all sides are charred and well done. You need to watch the oven so that you do not burn the tofu and vegetables. Put the remaining sauce in a small pan, and let it thicken over medium heat, for about 3 minutes stirring it occasionally, and set it aside in a small bowl. You could use this sauce to either drizzle on the top, or brush the done tofu with. In a large bowl, add in the Earthbound Farm Chopped Salad Asian Kit. Add in half the tahini dressing and crunchy toppings. Toss lightly to coat the salad. To assemble, divide the salad amongst 4 plates. Divide the skewers equally. Drizzle the remaining tahini dressing over the salad. Top with the crunchy toppings equally. Top with black sesame seeds, cilantro, scallion, sriracha peanuts. Your salad is ready to serve! This post has been generously sponsored by TheFeedFeed & Earthbound Farm - all opinions are my own.